Among the Sensex constituents, ICICI Bank was the biggest gainer with 11 per cent jump, followed by State Bank of India, which rose 8.04 per cent. 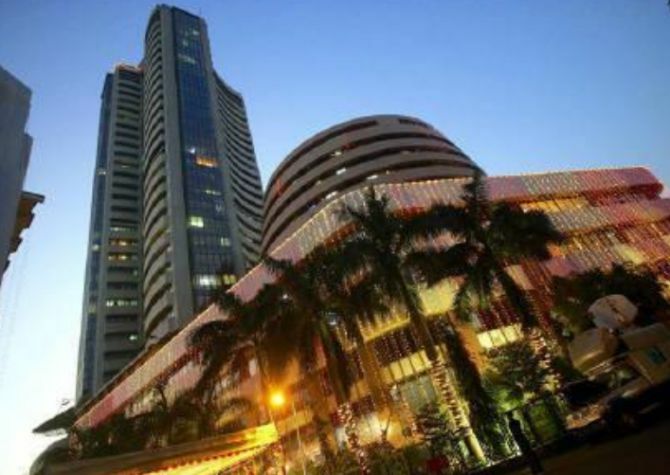 Equity benchmark Sensex on Monday surged over 718 points to close over 34,000-level buoyed by stellar performance of banking stocks tracking robust quarterly earnings and RBI's move to ease liquidity crunch. The country's top private sector lender ICICI Bank swung into profit in the second quarter of this ongoing fiscal. The bank had reported a net loss of Rs 119.55 crore in the first quarter of the current fiscal. Snapping its two-day losing streak, the 30-share index ended 718.09 points, or 2.15 per cent, higher at 34,067.40. It had opened 173.33 points, or 0.52 per cent, higher at 33,522.64. The NSE Nifty too surged 220.85 points, or 2.20 per cent, to reclaim the 10,250 mark. It had opened 44.25 points, or 0.44 per cent, higher at 10,074.25.